Easily upgrade a folding walker or a standard walker with the universal walker wheels and ski glides by Vive. Durably constructed, the wheels are compatible with any walker and provide extra stability and security while traveling on uneven surfaces. Easily convert any folding or standard walker into a rolling walker with the universal walker wheels and glides by Vive. The universal fit wheels are compatible with any standard walker model for an easy, hassle-free upgrade. Large caster sport wheels easily navigate over uneven surfaces. Smoothly rolling over any irregular surface, the rubber sport wheels are non-marking for use indoors. Allowing for smooth and easy mobility, the Vive walker ski glides are universally designed to easily attach to most walker styles. The curved ski glides slide into place and easily adjust to fit securely in any walker leg. Navigate over carpet, tile, pavement or concrete without dragging your walker or using unsightly tennis balls. This set of two walker ski glides also includes two felt glide covers for greater protection against snags and scratches on indoor surfaces.. 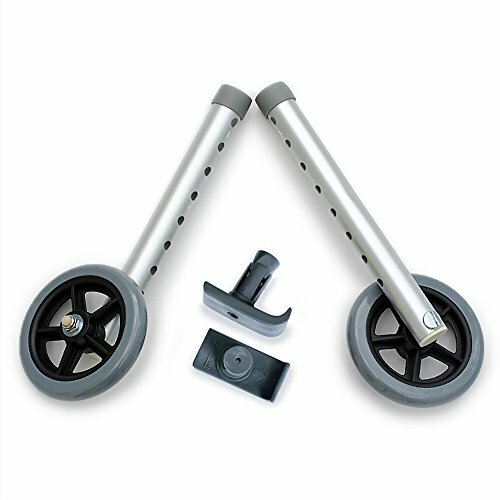 Easily install wheels and ski gliders on any folding or standard walker without special tools. The leg height can also be adjusted for a hassle-free, customized fit. 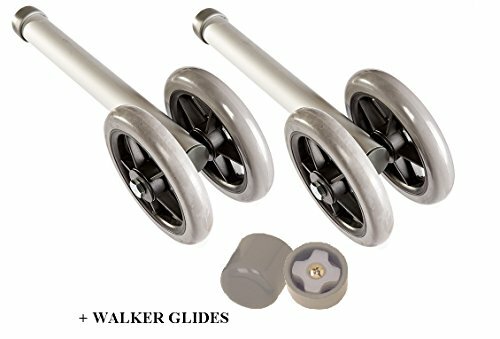 USE WITH ANY WALKER: Easily convert any standard folding walker into a smooth rolling walker with the Vive universal walker wheels and ski glides. 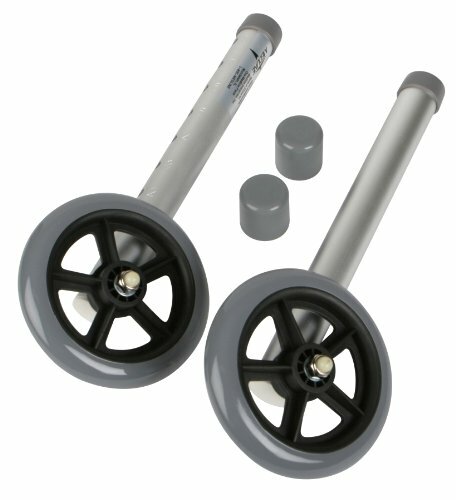 The universal fit wheels and extensions are compatible with any standard walker model for an easy, hassle-free upgrade. 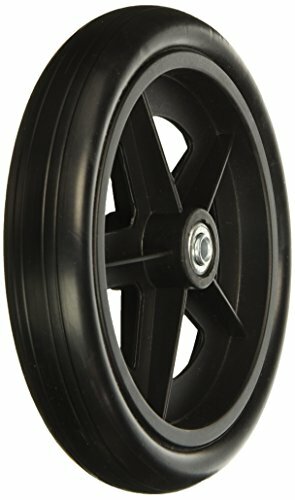 RUBBER SPORT WHEELS: Large five-inch caster sport wheels easily navigate over uneven surfaces. Smoothly rolling over carpet, pavement or grass, the non-swivel rubber sport wheels are also non-marking for safe indoor use on tile and hardwood floors. DURABLE GLIDE CAPS: Allowing for smooth, easy mobility, the Vive walker ski glides are universally designed to easily attach to most walker styles. The curved ski glides slide into place and easily adjust to fit securely in any walker leg. Navigate over carpet, tile, pavement or concrete without dragging your walker or using unsightly tennis balls. This set of two walker ski glides also includes two felt glide covers for greater protection against snags and scratches on indoor surfaces. TOOL-FREE ADJUSTMENTS: Easily install replacement wheels and ski glides on any folding or standard walker without special tools. The leg height can also be adjusted for a hassle-free, customized fit. Convert your walker into an off-road machine! Feel safe and easily glide over dirt, grass and uneven pavement. Enjoy outdoor activities without feeling restricted. Easy to install. No tools required. 8 wheels with 1 dia. aluminum tubes. Only Top Glides has a truly universal wheel kit so you know it can fit. Two big 5" rubber wheels for easier navigation. Double rows of holes for compatibility with most walkers. Height-adjustable without tools. Exclusive Top Glides FlexFit ski glides fit the widest range of walkers and are extra-thick for greater durability. Money back guarantee and FREE 2-3 DAY EXPEDITED SHIPPING UPGRADE for US customers. Super Value: Get the products you need at a great price and shipped fast to your door! Includes pair of FlexFit universal ski glides - $8 value! 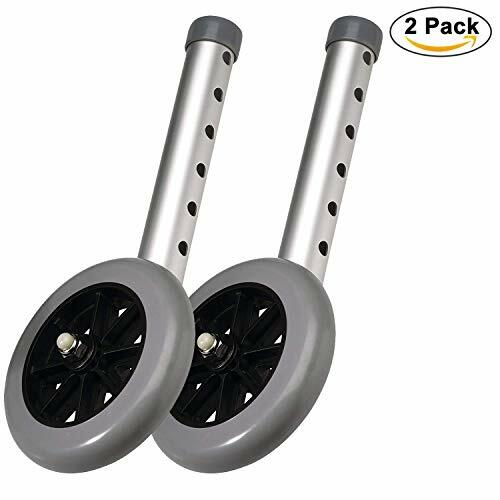 YOU GET A PAIR of 8 inch x 1 inch casters are flat free, solid wheels utilized on many wheelchairs, rollators, and walkers. Utilizing a solid exterior wheel, a composite hub, and 5/16" inner diameter of bearings for the axle hub is 2.5 wide. COMPLETE WITH GLIDES: Replacement wheels for walkers come with a pair of smooth sturdy rear glides, which makes for easy gliding over uneven surfacesThe hole for the pin is 5/16" The tube inside diameter is 1 1/16"
ADJUSTABLE HEIGHT: Walker rubber wheels allow for eight height adjustments, making them suitable for people with of any height. Weight capacity 350 lb. 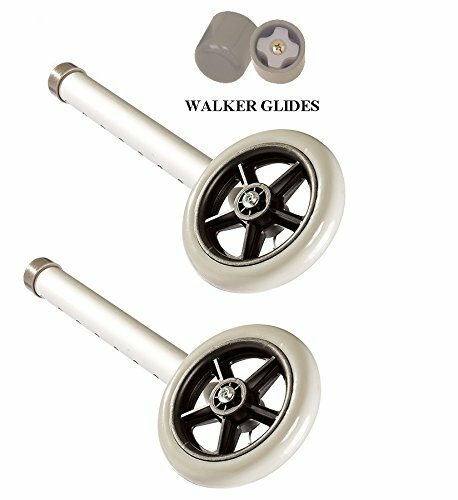 Walker wheels and walker glides accessories are easily installed on any universal or standard walker, with no need for specific tools. Universal swivel wheels transform a walker by making it easy to maneuver around corners and tight spaces. Switch between fixed-wheel and swivel-wheel modes in seconds. Thick rubber wheels are durable for long-life. Height adjustable with 5 settings. Includes our exclusive FlexFit universal ski glides so you know they can fit your walker. And our money-back guarantee helps ensure you're happy with your purchase. 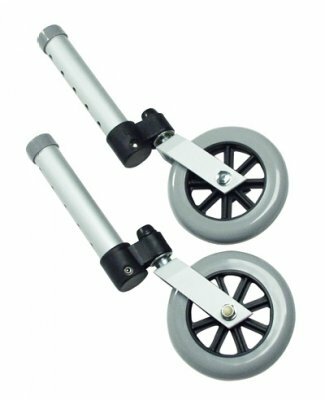 NOTE: Walker shown is a Top Glides SportWalker EZ (sold separately). 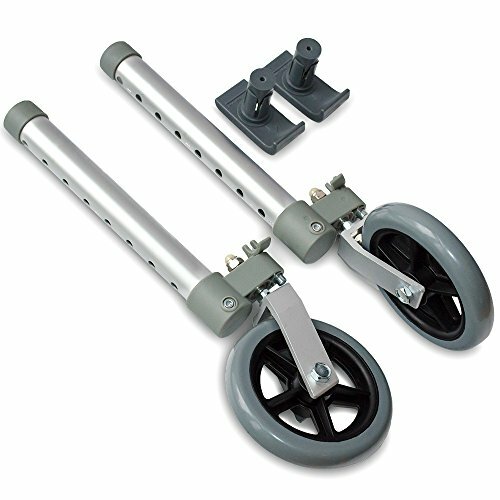 FITS TO ANY WALKER: Easily convert any standard or heavy-duty folding walker into a smooth rolling walker with the Healthline universal walker wheels and ski glides. The universal fit wheels and extensions are compatible with any standard walker and allow for 8 height adjustments. DURABLE GLIDE CAPS Comes with rear glide caps and glide covers allowing use on all surfaces. Healthline walker ski glides are universally designed to easily attach to most walker styles. 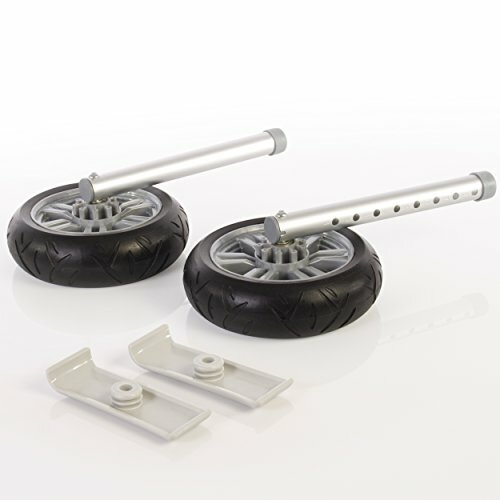 DUAL RUBBER WHEELS allow walker to roll easily and smoothly over irregular surfaces. Smoothly rolling over carpet, pavement or grass, the rubber wheels are also non-marking for safe indoor use on tile and hardwood floors. The 5" fixed wheels roll freely, helping the user to walk more naturally. 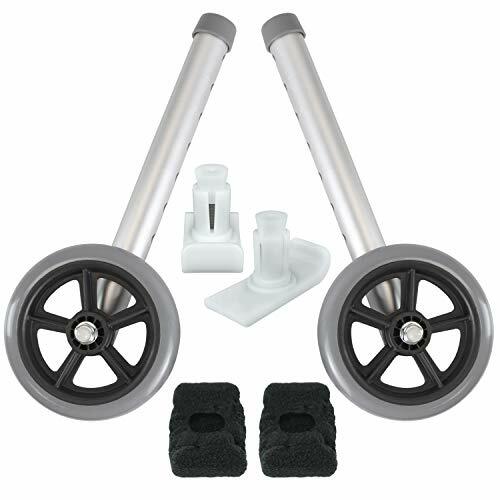 These wheels allow the walker to glide easily over irregular surfaces such as carpeting and door jambs. Designed for use on the front legs of a walker. Fits most walkers. 5" wheel diameter for the front of walker. Comes with 2 walker wheels. 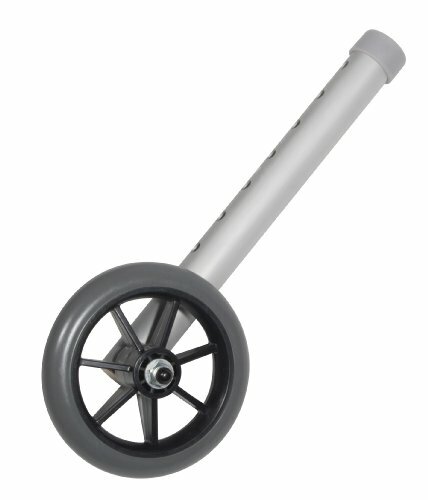 This gives a traditional walker 360 degree swivel wheels to provide the patient with maximum mobility. 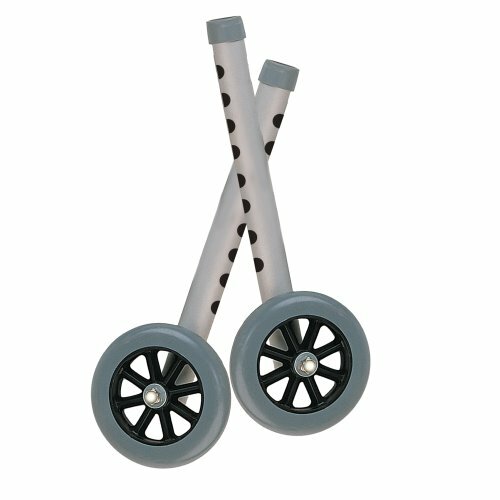 The wheels are large enough to glide over most surfaces without being stopped or getting stuck, and small enough to not interfere with the folding of your walker so it can still be efficiently stored. This makes these wheels easily manageable for daily usage and caretaker maintenance. Pivit's 5 Inch Wheels Provide The User With A Dependable And Durable Product That Works As Well Outdoors As 3" Wheels Do Indoors. 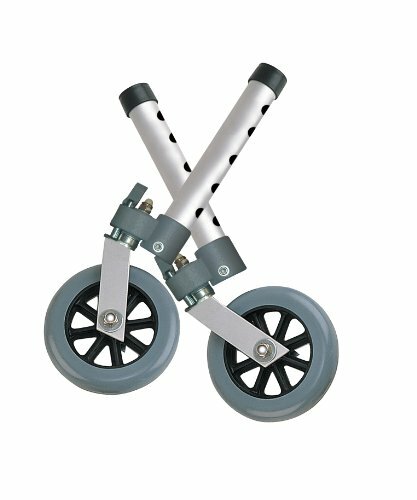 The 3" wheels are ideal for navigating over flat surfaces, while the 5" wheels and rear glides allow for the user to easily maintain a smooth roll on irregular surfaces. Works perfectly over places like pavement, sidewalks, and carpeting by employing the glide covers. These wheels can hold up to 300lb and are made for usage by those who have partial dependency or bariatric issues. CONVERTS MOST TRADITIONAL WALKERS TO WHEELED-STYLE FOR ENHANCED MOBILITY - These compatible walker wheels grant the user with a 360 degree turning radius to provide enhanced mobility. The wheels allow the patient to have great maneuverability and the walkers can still easily be folded in order to allow for convenient storage. UNIVERSAL COMPATIBILITY WITH EASY TOOL FREE ASSEMBLY - Constructed to fit any standard walker with 1 tubing. The Pivit swivel wheels attach to the front legs of the walker to provide mobility, while the back legs remain as the stabilizers and brakes. Only recommend with use of our Pivit glide brakes to ensure an easy assembly and application process. The tool-free assembly process is easy for anyone and requires no excess parts. 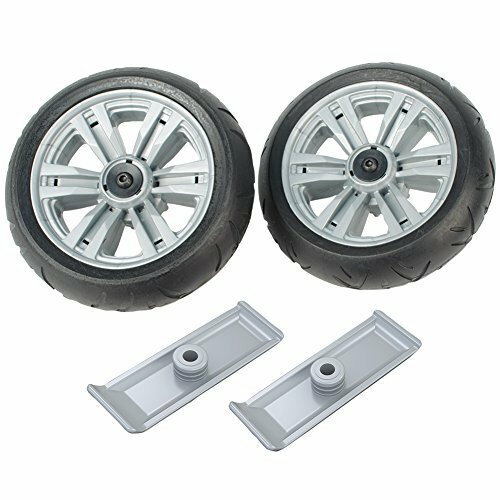 PREMIUM 5 INCH RUBBER SWIVEL WHEELS - 3 wheels are ideal for navigating over flat surfaces, especially indoors. These 5 rubber wheels and rear glides allow the user to easily maintain a smooth roll over irregular surfaces such as pavement and sidewalks as well as provide for simplified movement indoors. WHEEL SWIVELS ALLOW YOU TO TURN ON A DIME - Designed to work with any standard 1 walker tubing. 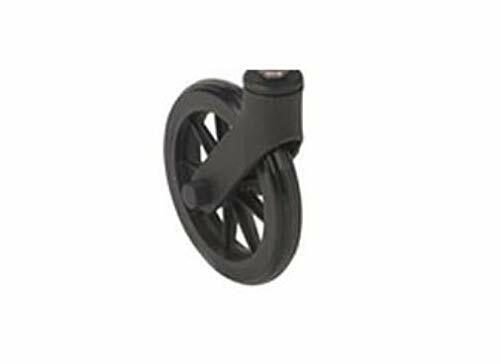 These swivel wheels allow for optimal maneuverability to allow for a smooth travel between tight spaces and crowded areas such as cruise ships, narrow streets, museums, shops, airports, and terminals. By giving the user an enhanced ability to comfortably go from place to place we hope to provide a sense of freedom to explore that is not provided by fixed wheels. COMES COMPLETE WITH GLIDE COVERS & LIMITED LIFETIME WARRANTY - Our two 5 wheels arrive with two glide covers which are ready to use. With a 300lb weight capacity, our product is durable and resilient enough to be used by those who are partially dependent and have bariatric issues. Meets all requirements of HCPCS code: E0155 and comes with a limited lifetime warranty. 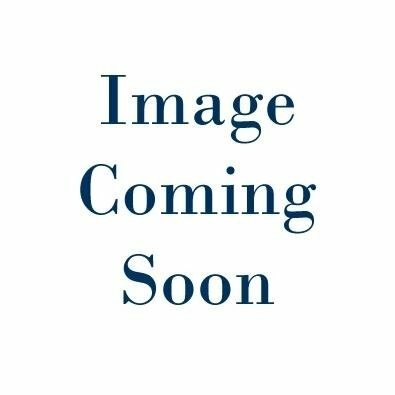 Karman Healthcare eight-inch casters are suitable as replacement wheels for any wheelchair, transport chair, rollator, or walker. 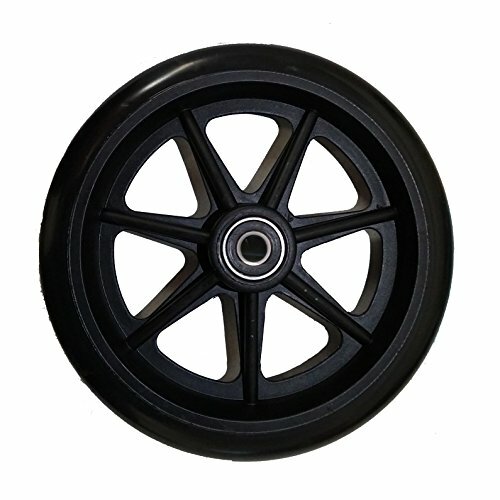 The large eight-inch Black colored wheels are non-marking and are perfect for both indoor and outdoor use. Poly-urethane solid casters allow individuals to use the wheels indoor without worry of marking interior surfaces such as tile, or carpet. Compatible with most rollators with bearing size 5/16", the C4608 is a suitable OEM replacement at a cost effective price point. Brand: Karman Healthcare | Manufacturer: Karman Healthcare Inc. Walk over virtually any surface with ease! Oversized heavy-duty wheels with treads are perfectly suited for grass, dirt, and other rough terrain to provide a smooth walking experience. Included pair of deluxe skis makes for easy gliding over uneven surfaces. Quick and simply installation-no tools required. 8" wheels with 1" dia. aluminum tubes. Fits most standard walkers. Helps users perform daily activities with less effort and fewer steps. 5 in. wheels provide more cushioning and improved maneuverability outdoors. Durable wheels wont mar floors and are corrosion-resistant and easy to clean. Set includes rear leg glide tips. Weight capacity: 300 lbs. Lifetime limited warranty. 1 pair. MORE CUSHIONING AND IMPROVED MANEUVERING OVER UNEVEN SURFACES. BOTH WHEELS AND BEARINGS ARE CORROSION-PROTECTED. WHEEL RIMS MADE OF DURABLE EASY TO CLEAN POLYPROPYLENE , TIRES MADE OF THERMOPLASTIC RUBBER FOR INCREASED DURABILITY. The Carex Bariatric Walker Wheels are made to fit the Adult Dual-Paddle Extra Wide Walker. The wheels attach to the front legs of the walker, allowing users to glide along most surfaces. 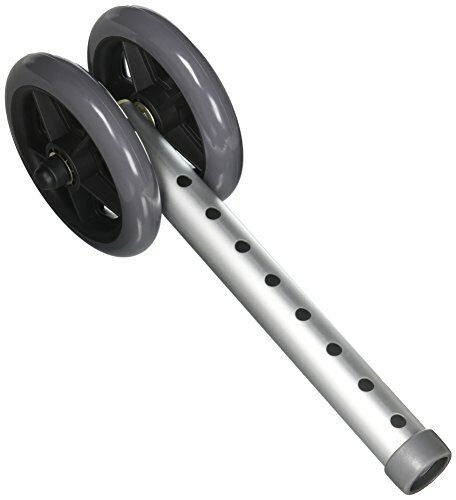 Provides weight support for up to 400lbs.